Simple network set up ‐ Just print and scan the encrypted QR code created during the Easy Setup process. Simple to use ‐ An intuitive display panel makes scanning tasks quick and easy. Easy to share ‐ More than one person can use a wireless network scanner. They're great for collaborative work spaces or small workgroups and they don't have cables! 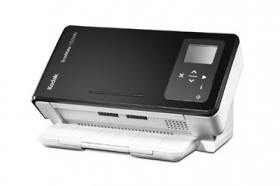 Easy to move around ‐ Wireless network scanners are portable and compact. Scan to any device ‐ Capture information to your computer, mobile or tablet. Cable free ‐ The clue is in the name. They're wireless, which means they are neat and tidy with no cable clutter. Cloud friendly ‐ Organize your documents in your favorite cloud applications like BOX, EVERNOTE or SHAREPOINT at the touch of a button using Smart Touch technology or use with browser-based capture applications such as KODAK Info Input Portfolio. Top quality imaging ‐ Scan everything from ID and credit cards to a wide range of business documents in high quality resolution with our Perfect Page image enhancement technology and reliable document feeding. IT friendly ‐ Integrates easily using standard drivers to give you the convenience of wireless scanning with your existing business applications. Simply Secure ‐ Set and control your own level of security with ease.